Stan Lee thought the name up. I did costume, web gimmick on wrist; spider signal. There are two legends about the Origin of Spider-Man. In one version, Stan Lee decides that he wants to create a character who is truly different and experimental, with an emphasis on realism. In some versions, he is on the point of quitting comics and turning his hand to novels or screenplays instead: his wife tells him that if he’s going to do that anyway, he might as well write one last comic book the way he wants to. In other versions, she just tells him out of the blue that he should put his heart and soul into his next comic book. In yet other versions, that conversation had nothing to do with Spider-Man -- instead his wife's advise brings about the creation of Fantastic Four. Just for kicks I wanted to try something different…For quite a while I’d been toying with the idea of doing a strip that would violate all the conventions, break all the rules. A strip that would actually feature a teenager as the star, instead of making him (ugh!) the adult hero’s sidekick. A strip in which the main character would lose out as often as he’d win — in fact more often. A strip in which nothing would progress according to formula. We’ll call this the Version A: the one where the Big Idea is Realism. In another version, Lee is pacing up and down his room trying to come up with an idea for a superhero. Suddenly (SNAP) a fly crawls down the wall. He suddenly realizes that a wall-crawling superhero would be cool. He runs through some names — Fly-Man, Insect-Man, Mosquito-Man and decides that Spider-Man would be dramatic. He decides that Spider-Man should be a down-to-earth teenager almost as an after thought. I’ve told this so often that for all I know it might even be true. I was trying to come up with an idea for a superhero, and while I was sitting at my desk I saw a fly crawling on the wall, and I said wow, would it be cool if we could have a guy stick to the wall like an insect. Okay, I needed a name. Insect-Man didn’t seem to do it for. Mosquito-Man, that wasn’t glamorous enough. I went down the list. Somehow when I came to Spider-Man it sent chills through me. So now you know how legends are born. We’ll call this Version B: the one where the Big Idea is Wall-Crawling. In both versions, Lee places quite a lot of importance on the name. In Version A, he decides that his new, realistic character should be called Spider-Man because he remembers an old pulp character called The Spider. In Version B, he brain-storms lots of superhero names and think that Spider-Man is the most dramatic. Either way, Lee thinks that the name Spider-Man is a core and irreducible part of the characters fame and success. Steve Ditko thinks that that was practically all he contributed. Version B sounds more believable than Version A. I can imagine a writer pitching “a teenage boy named Spider-Man who can climb up walls” to a publisher much more easily than I can “a strip that breaks the rules and doesn’t follow any formulas.” Of course, Spider-Man will develop into a ground-breaking, rules-avoiding, realistic strip, but I don't think that there was a moment in 1960 or 61 when Lee said "I know! I shall create a ground-breaking, rules-avoiding, realistic strip!” It's on a level with Martin Goodman dreaming up Captain America in his office in 1938. In both the A version and the B version Goodman hates Stan Lee’s pitch. There are three main reasons: people wouldn't buy a spider-themed comic, because people don't like spiders; it's impossible for the main character in a superhero comic to be under the age of 20; and no-one would like a character with personal problems. This makes very little sense. It’s true that that there had been a tradition for superheroes to be man/boy pairings like Batman and Robin or Captain America and Bucky. But when Lee pitched his idea to Goodman, the Legion of Superheroes – who are all teenagers, albeit in the 31st century – had been around for three years. Superboy, the teenage version of Superman, had been in continuous publication since 1945. And Marvel’s own Fantastic Four were doing very well, with the teenaged Human Torch very much an equal partner in the team. One month after Spider-Man’s debut he got his own solo feature. It would be very odd for Goodman to say that Stan couldn’t have a spider-themed character: there had been Golden Age character based on equally unpromising animals: the Silver Scorpion, the Black Widow and even the Ferret. And of course, DC had a moderately well-known character called the Batman. But it’s important that Martin Goodman hated the idea of Spider-Man, because all versions of the legend agree that Spider-Man first appeared in a comic which Marvel had already decided to cancel. We were about to discontinue our Amazing Fantasy series. That meant that nobody would care what stories I put into it, because it would be the last issue anyway. … You guessed it. It was a perfect opportunity to make sure the world would be Spidey-less no longer, and if the pundits were right and the strip failed, so what? It was the mag's last issue anyway. 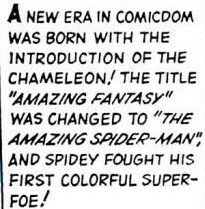 The legend contains an undeniably True Fact: the first Spider-Man story certainly did appear in the final issue of Amazing Fantasy. And that kind of fits in with Spider-Man being a hard-luck character. And Stan Lee’s fable is terribly endearing. We'd like it to be true. His latest version has Martin bursting out “that is the worst idea I’ve ever heard!” when he pitches Spider-Man to him; only to say “remember that character we both loved so much?” after he has seen the sales figures. But the story simply doesn't fit the facts. Perhaps most tellingly, Amazing Fantasy #15 had a new title and a new logo. The previous 7 issues had been called Amazing Adult Fantasy "the magazine that respects your intelligence". Lee says that they dropped the word "adult" from issue 15 out of nostalgia -- they thought it would be nice for the final issue to revert to the original title. 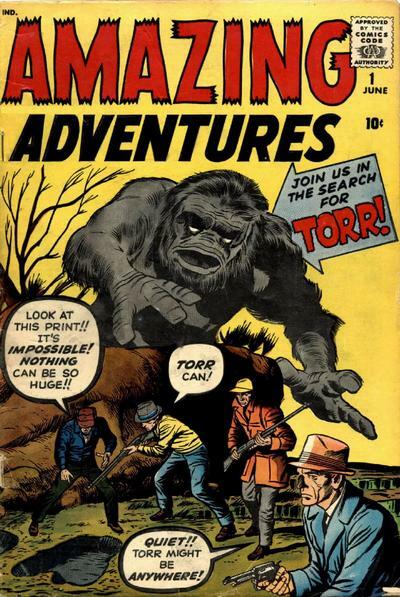 But this is just not true: Amazing Adult Fantasy took over the numbering of the boringly named Amazing Adventures. There never was an Amazing Fantasy #1 - #7. If you are going to kill off a comic, why go to the trouble of changing the title and drawing a new logo? The first Spider-Man story (in Amazing Fantasy #15) runs to 11 pages: two chapters of 6 and 5 pages respectively. The second one, in Amazing Spider-Man #1 runs to 14 pages — two chapters running to 6 and 5 pages, and a short 3 page chapter that breaks off unfinished. Amazing Spider-Man #2 also contains a 14 page Spider-Man story. Those first two issues are rounded out with weak 10 pages fillers; issue #3 is the first time we get a full-length Spider-Man story. So Lee and Ditko must have produced the first episodes of Spider-Man in the full expectation that Spider-Man would continue for least 3 months as the lead feature in an anthology magazine. We can never know what really happened. But perhaps it was something like this. Stan Lee pitches a new comic to Goodman: “What if we did a comic about a teenager named Spider-Man who can stick to walls like a fly?”. Goodman okays Spider-Man on the basis of that pitch. Ditko and Lee produced the first four and a bit chapters of what we would now call a graphic novel, to be serialized in Amazing Fantasy: a bleak, down-to-earth account of a young man with superpowers in a world without superheroes or supervillains. This wasn’t how Goodman imagined Stan's new superhero character at all, and when he saw it, he summarily cancelled the book. Speculation, of course. But Mark Evanier is quite sure that Goodman took against Spider-Man after Amazing Fantasy #15 had been published. He wasn't there, but he was on very close terms with Jack Kirby, who was. And Will Murray has done very detailed work on Marvel's "job numbers" of the period, which enable him to reconstruct the sequence in which various strips were written. He is quite certain that the main strip in Amazing Spider-Man #1 was indeed intended for Amazing Fantasy #16. 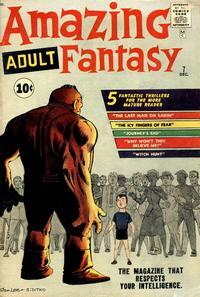 Some versions of the story say that Goodman was forced to eat his words when he saw Amazing Fantasy #15’s sales figures. If that is true, then why didn’t he go right ahead and release Amazing Fantasy #16 as originally planned? Some versions (including the very first page of Amazing Spider-Man #1) say that it was reader feedback which made Goodman give Spider-Man a second chance, which still doesn’t account for the seven month gap. Speculation again: I wonder if Stan Lee was as unhappy as Goodman with the very dark and realistic treatment that Ditko supplied. Certainly, as the relationship wore on, Ditko resisted Lee's more fantastic ideas – he made the Green Goblin a scientific gadget guy rather than a resurrected Egyptian mummy; he felt that the spider-sense was a dubious plot device and that even the space-capsule rescue in Spider-Man #1 was a step in the wrong direction. Isn’t it possible that Lee clung on to his belief that Spider-Man was a great name and wall-crawling was a great power; reworked the feature into a more conventional crime fighting saga, and nagged Goodman into giving it another try? Spider-Man #2 has Peter Parker consciously deciding to become a "secret adventurer"; and fighting his first supervillain. Even issue #1 shows some signs of having been worked over to make the character more like a superhero. And now there is a very large elephant in the room. An elephant named Kirby. The legendary account of Spider-Man’s creation has to account for the existence of a 5 page treatment of Spider-Man drawn by Jack Kirby. No-one has ever denied that this document existed: Jim Shooter says he had sight of it when he was Marvel editor in the 1980s. Stan Lee's story is that he described his realistic ground breaking hero to Kirby, but that Kirby’s artwork was too super-heroic for the character he had in mind and handed the existing pages to Ditko to rework. I would be inclined to see this as another etiological myth. It is quite true that a Kirby Spider-Man would have been an heroic Spider-Man, a super-powered Spider-Man, a Spider-Man quite different from the one who became famous. So (in one sense) taking Kirby off the book and giving it to Ditko allowed the Spider-Man we know and love to come into being. So Lee tells us a fable in which the real Spider-Man was in his head all the time, and that when he fired Kirby, he knew exactly what he was doing. Just to confuse things further, Joe Simon, Kirby’s former partner, says that he had suggested the name Spider-Man to Kirby. In one sense, this doesn’t matter very much. The Kirby and Simon proto-spider-man characters didn’t have anything very much in common with the character that Ditko and Lee thrashed out over the first two or three issues of Amazing Spider-Man. But it matters in terms of Lee’s myth-making. He thinks that the person who dreams up the idea creates the character; and according to the more plausible B version, that "dreaming up" didn't amount to much more than spotting that Spider-Man would be a way cool name for a superhero. If you were Joe Simon, and you distinctly remember handing Kirby a sketch and a logo for a character called Spider-Man, and if Kirby had passed that sketch on to Lee years later, and Lee had used the name for a hugely popular character, and if you had to listen for decades afterwards to Stan Lee explaining how he dreamed up Spider-Man in a flash of fly-fueled inspiration.... Well, you can see how that might rankle. But in the end, it’s a theological question. Even if Stan’s story about the fly on the wall is the literal truth, it's not what most people would understand “creating a character” to mean. In 1999, Stan Lee wrote an actually pretty generous letter to Steve Ditko, acknowledging that Ditko’s input into Spider-Man amounted to co-creation, but insisting that the name and original idea was his own. He couldn’t have been expected to go any further. In neither Version A or Version B does Stan Lee claim that “bitten by a radio-active spider” was part of his original light-bulb moment. In fact, it couldn’t have been, because by all accounts Kirby’s rejected version was about a teen-aged boy who turned himself into Spider-Man by means of a magic ring. Lee is back projecting again. The final version of Spider-Man was about who boy who'd been bitten by a spider, so obviously, this was his original idea. But...but...but...Spider-Man doesn’t have the ability to shoot webs. He certainly didn’t gain that ability from the spider-bite. Ditko has him invent wrist-mounted web-shooters in his bedroom. Kirby would have given him a web gun. The web-shooters are one of the things Ditko is quite sure he thought up. And isn’t that most likely to be the boring truth? There was no eureka moment. Stan Lee’s big idea was a character called Spider-Man who could crawl up walls. That was the one line pitch he gave to Steve Ditko, which Steve Ditko turned into a work of art, better than Lee had any right to expect. Lee very likely got the idea from Jack Kirby, who very likely got it from Joe Simon. It doesn't matter. Nothing in that rather boring idea gave the slightest hint as to what Spider-Man would become. that concludes the introduction to my cosmic collection of esoteric essays about the worlds best loved wall-crawling super-character. Next week, we'll be effervescently embarking on a deservedly detailed issue by issue analysis of the yodel-filled year 1963. I have about 12,000 wunderkind words lined up (taking us as far as issue 4) but obviously there's a lot of woebegone work and radical research to go if I'm going to finish my caustic commentary on the devastating Ditko years, to say nothing of the rest of the swinging 1960s. so please go over to my proudly pontifical Patreon page and see how you can propel me into from being a humbly heroic hobbyiest to a sturdily sucesful semi-professional. GROTH: Can I ask what your involvement in Spider-Man was? KIRBY: I created Spider-Man. We decided to give it to Steve Ditko. I drew the first Spider-Man cover. I created the character. I created the costume. I created all those books, but I couldn’t do them all. We decided to give the book to Steve Ditko who was the right man for the job. He did a wonderful job on that. Lots of discussion in the comments about the veracity of Kirby's claim. I'm a comics fan, but not a huge fan of old comics--though acknowledge the history and lineage and so enjoy essays like this one. One of the things I don't enjoy is the art which looks, well, old. I say this with the full knowledge that the late 80s and early 90s art with which I grew up looks nothing now like it used to--all those gritted teeth. 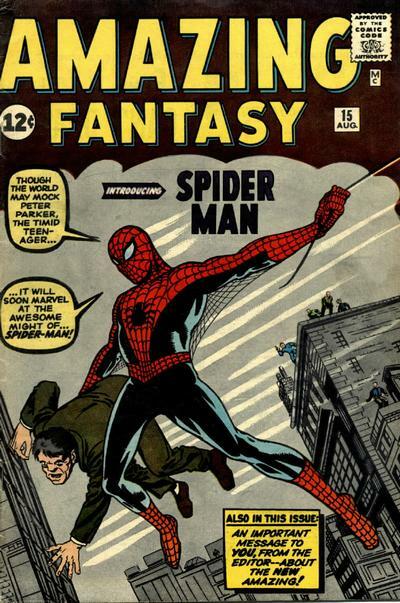 That's a preamble to saying that the cover to Amazing Fantasy #15 IS Spider-Man. A strange pose (he's not flying), buildings at an odd angle, a terrified criminal under one arm (he fights crime and he's strong). It doesn't say anything about Peter Parker, which is admittedly the other half of the magic, but it says everything about Spider-Man.